Alphabet Exercise by ROCK 'N LEARN INC. This DVD promotes fitness and imaginative play while teaching children about letters. Young learners may enjoy performing new and traditional exercises, developed with a certified fitness trainer. It runs approximately 37 minutes. "Children get exercise and build coordination while learning their ABCs," Cindy Burleson, communications coordinator for Rock 'N Learn, told TDmonthly. The product received a Best Vacation Product award from Dr. Toy. Launch date: 2003. Beginning Fractions and Decimals DVD by ROCK 'N LEARN INC. This DVD is designed to offer cool music, colorful animation, amusing characters and lots of humor to help students learn about fractions and decimals. It covers congruent parts, equivalent fractions, proper and improper fractions, mixed numerals, decimals and more, explaining and illustrating examples to help ensure that even difficult concepts are easy to grasp. Delayed answers give learners time to test their skills. It runs approximately 35 minutes. "Kids enjoy the comical characters Frances Fraction, Dennis Denominator, and Newman Numerator as they explore how fractions and decimals are used in real-world applications," Cindy Burleson, communications coordinator for Rock 'N Learn, told TDmonthly. This DVD received the Parents' Choice Recommended award in 2003 and was one of Dr. Toy's 10 Best Video Products. Launch date: 2003. Multiplication Rock (CD and Book) by ROCK 'N LEARN INC.
Each group of facts through 12 has its own distinctive song to keep students tuned in and motivated. The CD runs approximately 30 minutes. "Energetic songs make learning fun and one of our best sellers still today," Cindy Burleson, communications coordinator for Rock 'N Learn, told TDmonthly. This product has won the following awards: Parents' Choice Recommended; Dr. Toy Best Classic Products; and the National Parenting Center Seal of Approval. Launch date: 1997. Addition & Subtraction Rock by ROCK 'N LEARN INC. This product is designed so that as students sing along, they can quickly learn sums up to 18 and differences from 18. The CD runs approximately 40 minutes. "Upbeat music, energetic performers and a delayed answer section helps students learn facts quickly. [This is] one of our top audio best sellers," Cindy Burleson, communications coordinator for Rock 'N Learn, told TDmonthly. It has received the following awards: Parent’s Guide to Children’s Media and Dr. Toy's 10 Best Educational Products. Launch date: 2003. 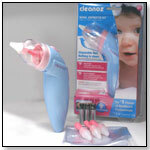 This battery operated nasal aspirator uses Disposable Reservoir Nozzle Pieces. Thanks to the disposables, no clean-up is necessary after use; just toss away the disposable (one per day). The disposable reservoir protects the inside pump from germs to guard against germ spreading, making Cleanoz a sanitary solution. Replacement tips are sold in boxes of 10. This product received a Creative Child Magazine Award 2008 and PTPA Media Award 2008. Launch date: February 14, 2008. Spanish DVD by ROCK 'N LEARN INC.
Spanish Volumes I & II is designed to offer an easy way to learn greetings, counting, colors, survival phrases, subject pronouns, travel phrases and more. It was created with energetic performers that entertain and motivate while delayed answers make it convenient for students to check their progress. The DVD runs approximately 55 minutes. It has received a Parents’ Choice Recommended Award and a Parent’s Guide to Children’s Media Award. Launch date: 1993. Multiplication Rap (CD & Book) by ROCK 'N LEARN INC.
D.J. Doc Roc takes students on a lyrical adventure to memorize facts through 12, quickly and accurately. Learning becomes a game when answers are delayed the second time facts are presented. A separate and unique song for each group of facts holds interest. As a new feature, students learn to skip count by two through 12 and by 25. This set includes both a CD and a book with fun activity pages featuring puzzles, games and exciting math mazes. It runs approximately 39 minutes. This product has won a National Parenting Center Seal of Approval and a Learning Magazine Teachers’ Choice Award. Launch date: October 2008. This cuddly Zoobie is designed to be ideal for road excursions or just cuddling in bed. In addition to a teddy bear, it also serves as a comfy pillow and soft blanket — all in one. "We are the only company that turns a plush animal into a pillow and a blanket," CEO JC Smoot of Zoobies told TDmonthly. Bubba received a 2009 Top Fun award from Tillywig and a 2009 Best Vacation Children's Products award from Dr. Toy. Launch date: February 15, 2009. The Mini Excavator is made of precut pieces of wood that are designed for easy assembly. The product is created to teach the technology of the same machines seen in the construction site. No batteries are required. It was honored in the 2008 Creative Play Awards. Launch date: 2008. This soft, pliable, moldable dough is made from water, flour, salt, cream of tartar, canola oil and citric acid. The company uses colors that are made using only all-natural plant and vegetable extracts; no artificial colors or chemicals are used. The Super Mega Fun Pack contains one 4-oz. 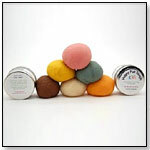 container of each of the colors (natural, brown, green, orange, pink and yellow) and a little rolling pin in a reusuable cotton bag. "When Happy Fun Dough has come to the end of its long and fruitful life, just put it on your compost pile and reuse or recycle the cute tin container," Christine Stewart, owner of For My Kids, told TDmonthly. This product received Dr. Toy's Best Classic Toys of 2009 award. Launch date: November 2008. Viewing products 671—680 out of 1181 products.